Venus' dazzling beauty at night explains its name. It is named for the Roman goddess of love and beauty. A 1979 Pioneer 6 Venus image of Venus’ clouds seen in view of Venus’ Maat Mons volcano.ultraviolet. Only radar can penetrate Venus¹s thick clouds to reveal its topography (blues are low areas; tans are high areas). Aphrodite Terra, a bright highland roughly the size of Africa, winds across Venus¹s southern hemisphere (false-color image data from Magellan, Arecibo Observatory, Pioneer Venus, and Venera). 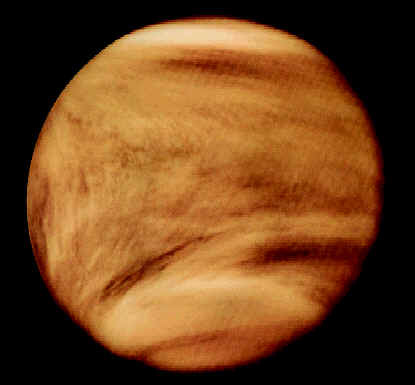 (Right, top) Venus¹s thick clouds of carbon dioxide produce a ³runaway greenhouse effect.² The Y-shaped cloud patterns indicate wind speeds up to 500 km per hour in the upper layers of the atmosphere (Pioneer Venus near-ultraviolet image). (Right, center) This cluster of large craters in an area the size of Michigan range in diameter from 50 to 37 km (Magellan). Bright areas of ancient lava blanket the flanks of the 6-km-high volcano Maat Mons. The vertical scale in this image has been exaggerated 23 times to enhance small features and aid analysis of the area. The color is simulated based on data by the Soviet Venera 13 and 14 spacecraft (Magellan). (Right, bottom) Seven steep-sided and flat-topped domes of lava have oozed onto the plains east of Alpha Regio. They average 25 km in diameter with maximum heights of 750 meters (Magellan). Although we cannot normally see through Venus' thick atmosphere, NASA's Magellan mission to Venus used radar to image the surface, and Galileo used infrared mapping to view mid-level cloud structure. Like Mercury, Venus can be seen periodically passing across the face of the Sun. These transits of Venus occur in pairs with more than a century separating each pair. Since the telescope was invented, transits were observed in 1631, 1639; 1761, 1769; and 1874, 1882. On June 8, 2004, astronomers worldwide saw the tiny dot of Venus crawl across the Sun; the second in this pair of early 21st-century transits will occur June 6, 2012. The atmosphere consists mainly of carbon dioxide, with clouds of sulfuric acid droplets. Only trace amounts of water have been detected in the atmosphere. The thick atmosphere traps the Sun's heat, resulting in surface temperatures over 470 degrees Celsius (880 degrees Fahrenheit). Probes that have landed on Venus have not survived more than a few hours before being destroyed by the incredibly high temperatures. The Venusian year (orbital period) is about 225 Earth days long, while the planet's rotation period is 243 Earth days, making a Venus day about 117 Earth days long. Venus rotates retrograde (east to west) compared with Earth's prograde (west to east) rotation. Seen from Venus, the Sun would rise in the west and set in the east. As Venus moves forward in its solar orbit while slowly rotating "backwards" on its axis, the cloud-level atmosphere zips around the planet in the opposite direction from the rotation every four Earth days, driven by constant hurricane-force winds. How this atmospheric "super rotation" forms and is maintained continues to be a topic of scientific investigation. About 90 percent of the surface of Venus appears to be recently solidified basalt lava; it is thought that the planet was completely resurfaced by volcanic activity 300 to 500 million years ago. 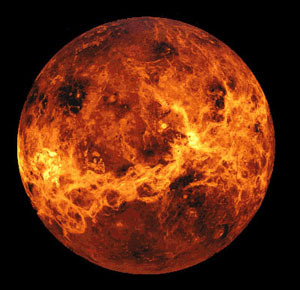 Sulfur compounds, possibly attributable to volcanic activity, are abundant in Venus' clouds. The corrosive chemistry and dense, moving atmosphere cause significant surface weathering and erosion. Radar images of the surface show wind streaks and sand dunes. Craters smaller than 1.5 to 2 kilometers (0.9 to 1.2 miles) across do not exist on Venus, because small meteors burn up in the dense atmosphere before they can reach the surface. Ishtar Terra, about the size of Australia, in the north polar region; and Aphrodite Terra, about the size of South America, straddling the equator and extending for almost 10,000 kilometers (6,000 miles). Maxwell Montes, the highest mountain on Venus and comparable to Mount Everest on Earth, is at the eastern edge of Ishtar Terra. 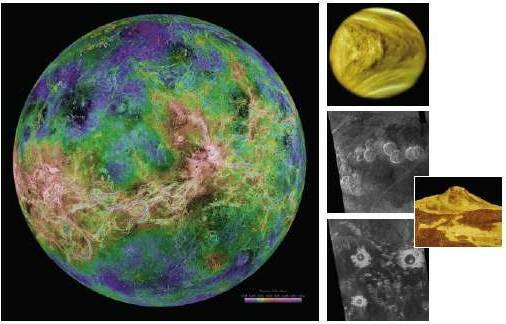 Venus has an iron core about 3,000 kilometers (1,200 miles) in radius. Venus has no global magnetic field, though its core iron content is similar to that of Earth, Venus rotates too slowly to generate the type of magnetic field that Earth has. By Comparison: Comparable to the average density of the Earth. By Comparison: If you weigh 100 pounds on Earth, you would weigh 91 pounds on Venus. CO2 is largely responsible for the Greenhouse Effect and is used for carbonation in beverages. N2 is 80% of Earth's air and is a crucial element in DNA.